Delta introduces the AH500 Series, a new, mid-range programmable logic controller (PLC) to meet diverse market requirements. The AH500 not only features enhanced execution speed and larger memory capacity, but also greater system flexibility and a large selection of modules to satisfy different customer needs. Delta’s AH500 provides a user friendly and flexible system structure that supports up to 4,352 local I/O extensions and 128,000 remote I/O extensions. The local extension does not require a specific module, and can easily be connected by extension cables. The length of extension cable between each AH500 local extension rack can reach a maximum of 100m, greatly enhancing system flexibility. In addition, the AH500 implements DeviceNet as its first stage solution for remote extension. 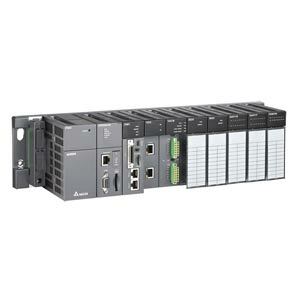 It supports up to 8 master stations with each supporting up to 63 remote I/O (RTU) stations, with all remote I/O stations maintaining the unique flexibility of local extension. 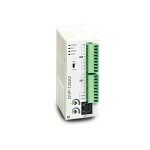 No matter if it is a local or remote extension bus, backplanes and modules share the same design. The user no longer needs to prepare different modules for different extension racks. The AH500’s large-scale but convenient-to-use system structure simplifies the integration of complex systems. The AH500 adopts a modular design and supports many modules with different functions such as DIO/AIO/temperature/network/motion control modules. It allows users to construct the best control system for their specific needs. The AH500 also supports hot-swapping that allows the user to replace modules without stopping the CPU’s operation, preventing losses due to a pause in the system’s operation. The AH500 also features an integrated model with built-in Ethernet and memory card function. 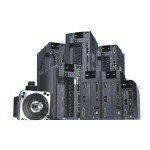 All AH500 CPU modules support convenient PID and function block to enhance programming efficiency.